Americans just passed more than a dozen anti-corruption laws across America. We won in red states and blue states with broad bipartisan support across the country. Together, we are marching toward an America where the government works for the people, not just a handful of billionaires and special interests. From Missouri to Colorado, Michigan to North Dakota, RepresentUs members knocked on doors, collected signatures, made calls, sent texts, and donated to drive the anti-corruption movement forward. RepresentUs members celebrate Amendments Y and Z outside the Colorado State House. Chapter leader Carl Parrish and Represent Arizona before their Phoenix win. 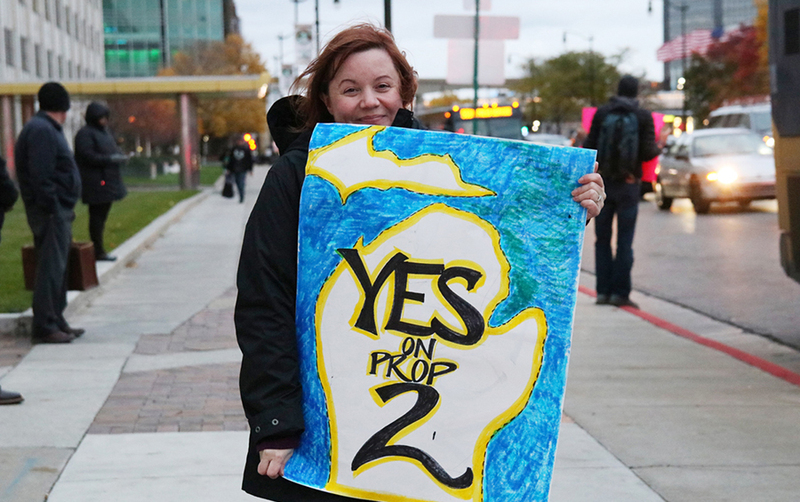 RepresentUs members participated in a Honk and Wave to support Prop 2 in Michigan. Represent North Dakota marched to get out the vote for Measure 1. Check out our Election Hub page to see a breakdown of all the anti-corruption campaigns passed and learn more about each of them. We won 22 victories in 2018, but our work isn’t done. In the coming weeks, we’ll pursue a bold new plan to multiply our efforts. We’ll recruit millions more supporters, we’ll take on dozens more campaigns… we’ll put the corrupt establishment on notice: the voters are coming to unrig the system. Be part of it: Join the movement to end corruption.